Sporting pursuits are set for a substantial boost in the West Sussex seaside town of Littlehampton as a new £17M leisure centre is under way. Steel tonnage: 300tA buoyant sector within the construction industry at present is the leisure category, as a number of local authorities around the UK are currently updating and replacing old swimming pools, aquatics parks and sports halls. Steelwork, more often than not, is the framing solution for these projects as the material can easily create the long span column-free spaces required in leisure centres. An example of this work is the £17M steel-framed leisure centre under construction for Arun District Council at Littlehampton. Replacing an existing centre, the new multi-million pound facility will include an eight-lane 25m-long swimming pool, 17m-long training pool with a moveable floor, 100 station gym, dance studio, spinning studio, four-court sports hall as well as a café and meeting rooms. Project architect Space & Place (S&P) says it has been designing sports and leisure centres for over 35 years and has gained a great understanding of the benefits steel can bring, in particular in providing visually lightweight structures over the long span, column-free volumes required for sports halls and swimming pools. “Improvements in paint technology and protective systems, combined with reduced cold bridging, ensure steel offers our clients an attractive long term structure without high maintenance costs,” explains S&P Associate Director Nic Bryant. “At Littlehampton the seaside location has poor and wet ground conditions so cantilevered steel frames and transfer trusses were used to help reduce the number of columns and associated piles and ground beams. The design is slightly elevated above the existing ground level to minimise the impact of the high water table during construction, but more importantly above potential flood levels should the sea wall ever be breached. This approach has the added bonus of improving views out to sea and increasing visibility along the seafront. Steelwork has offered the design team the most efficient method of forming the long uninterrupted spans needed within the centre, as well as being a material that is quick to erect, thereby helping to keep the construction programme on schedule. Main contractor Willmott Dixon started on-site late last year, inheriting a plot that had already been cleared of its previous buildings. “Our early works included flattening the site and installing a piling mat, with piles up to 28m-deep. This then allowed the steel frame to be erected which was completed by the end of March,” explains Willmott Dixon Senior Building Manager Tom Hooper-Smith. Steelwork contractor William Haley Engineering erected the majority of the project’s steelwork using a 60t-capacity mobile crane, with the only exception being a 22m-long × 3.5m-deep truss which required the use of a 130t-capacity crane. Weighing 10t, the truss runs down the spine of the facility and is an important element of the project as it sits between the two pools and creates an open-plan space for the entire aquatics area. The truss performs two essential tasks; its top chord supports a series of 22m-long beams that span over the main pool, while its bottom chord picks up the steelwork that forms a plant deck that in turn spans over the training pool. Like most of the steelwork throughout the project, this truss will be left exposed within the completed scheme. Consequently, the client did not want any visible splices ruining its vision of a clean aesthetic steelwork centrepiece. “We had to fabricate the truss from box sections for cost and efficiency and then deliver it to site in one piece,” says William Haley Engineering Project Manager Steve Worner. The remainder of the project’s steelwork was brought to site in smaller sections, including the beams that span the pools. These members all have a splice splitting the beam at third points. The roof beams were assembled on the ground and then lifted into place as one section. A similar scenario was also played out for the 20m-long rafters that span the sports hall. The sports hall is a large braced box with flat vertical bracing positioned around its four windowless walls. Other areas of the leisure centre, because of glazed elevations, were a little trickier when it came to finding locations for the bracing. In these areas, such as the pool hall, hollow section bracing has been installed within the roof steelwork. Accommodation is spread over two-storeys with views into and out of the pool from the park, while the south facing gym and café look out across the beach, with particularly spectacular views from the gym which is on the first floor. The high quality contemporary design is said to reflect the Council’s commitment to regeneration through design, in addition to a reflection of the importance of the seafront location. On the upper level, some of the bracing has been turned into an architectural feature, with rod bracing placed within the large glazed façade of the gym which, as well as being positioned along the seaside facing elevation of the building, is also above the main entrance. 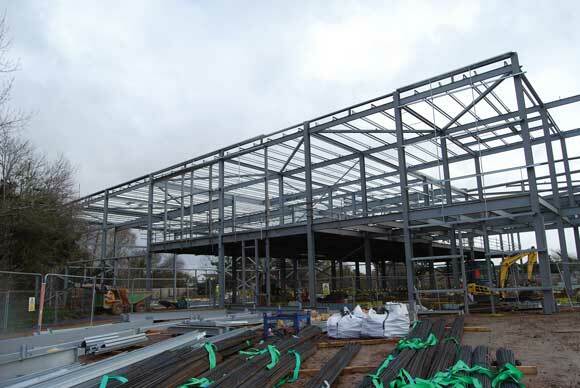 The upper level is formed with a composite slab using metal decking supported by the steelwork. The floor wraps around the pool and sports hall – which are both double-height spaces – in a large L-shape. As well as the gym, the upper floor also accommodates the two studios. Working for William Haley Engineering, Composite Profiles are detailing, supplying and installing more than 1,700m² of Tata Steel ComFlor 51+ decking, 500m of edge shutter and 9,000 thru-deck welded shear studs to this project.